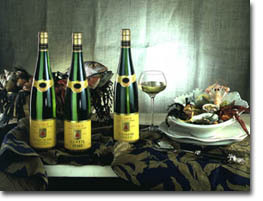 Generic "Hugel" wines are made exclusively from grapes purchased from winegrowers under long-term contract, in a dozen of the most favoured localities around Riquewihr. With true Alsace character, these "Hugel" wines faithfully mirror the characteristics of each varietal and each individual vintage. This wine revives an ancient Alsace tradition that wines assembled from noble grape varieties were called "Gentil". Gentil "Hugel" allies the suave, spicy flavour of Gewurztraminer, the body of Pinot Gris, the finesse of Riesling, the grapiness of Muscat and the refreshing character of Sylvaner. Delicate, subtle and well built, it makes an excellent apéritif because, although nicely rounded, it is also refreshing. The perfect all-purpose dry white wine, it goes well with country buffets, white meats, fish and shellfish. Made from the grape variety of Burgundy, this agreeable red wine presents a distinctive Alsace character. The great speciality of our region. Only in Alsace does the aromatic expressiveness of this variety attain such summits. The noblest white wine of them all, Riesling is dry and aristocratic. Our climate and soil enable this variety to achieve its fullest potential. Elegant and distinguished, it partners all the gastronomic specialities of Alsace, as well as seafood and grilled or poached fish. A dry white wine with firm regional character, fresh and agreeably easy to drink, particularly when young. At its best with all light, uncomplicated meals.